Resistance thermometers of this series are used as universal thermometers for the measurement of liquid and gaseous media in the range -50 ... +250 °C (-58 ... +482 °F). For application in hazardous areas, intrinsically safe versions are available. They can be used for pressures up to 140 bar with 3 mm sensor diameters and up to 270 bar with 6 mm sensor diameters, depending on the instrument version. All electrical components are protected against humidity (IP67 or IP69K) and designed to withstand vibration (20 g, depending on instrument version). Insertion length, process connection, sensor and connection method can each be selected for the respective application within the order information. 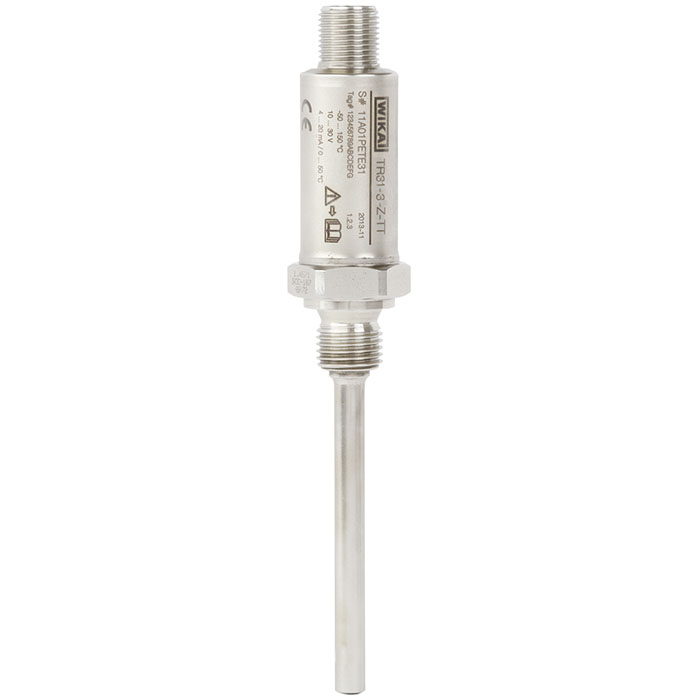 The model TR31 resistance thermometer consists of a thermowell with a fixed process connection and is screwed directly into the process. The electrical connection depends on the design and is made with an M12 x 1 circular connector or via a directly connected cable. For the M12 x 1 circular connector, an adapter for electrical connection with angular connector per DIN EN 175301-803 form A (patent, property right registered under no. 001370985) is optionally available. As a special feature, the miniature OEM resistance thermometer is also available in customer-specific designs.